34yr.old female w/ previous rt low lobe nodules since 2001 CT revealed the nodules while patient had chickenpox. 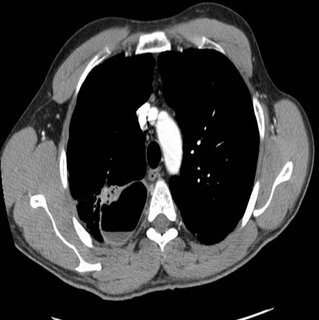 New CT in 2006 shows new node on lt. upper diaphragm. Last CT 6mo. 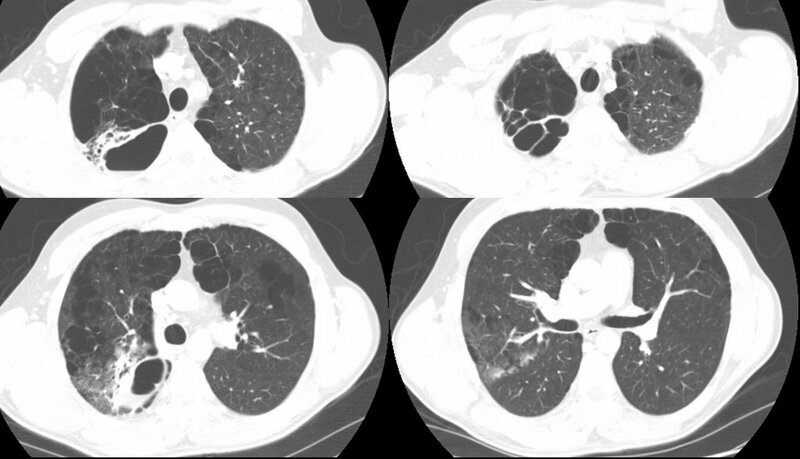 prior didnt show nodule, which is uncalcified unlike rt. 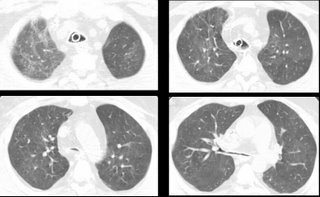 lung nodes. PT. has nightsweats wt. loss chronic pelvic abdominal pain jointpain/swell/stiff no appetite ab.bloat chronic urinary symptoms and UTI. Now with SWOLLENLYMPHNODES W/LYMPH SURFACING AND RUPTURE ON NECK BACK OF HEAD BEHIND EAR. PT. is 11/2 ppd smoker of 13yrs. PET done 4/06 and no malignant chest activity. labs almost normal. Congratulations to one of our editors: Jeff Jennings tied the knot this past weekend. We will keep posting while he is on his honeymoon. Proceed or watch? Is it CA? 8/1/06 49 YO Caucasion male, married with minor children, comfortably employed professional, USAF Gulf War Veteran, 2-3 PPD smoker X30 years, ETOH dependent (averages 6-10 beers daily)presents with R clavicular pain after home remodeling project. Well developed, well nourished, muscular, athletic body type. VS WNL. Non remarkable EKG. 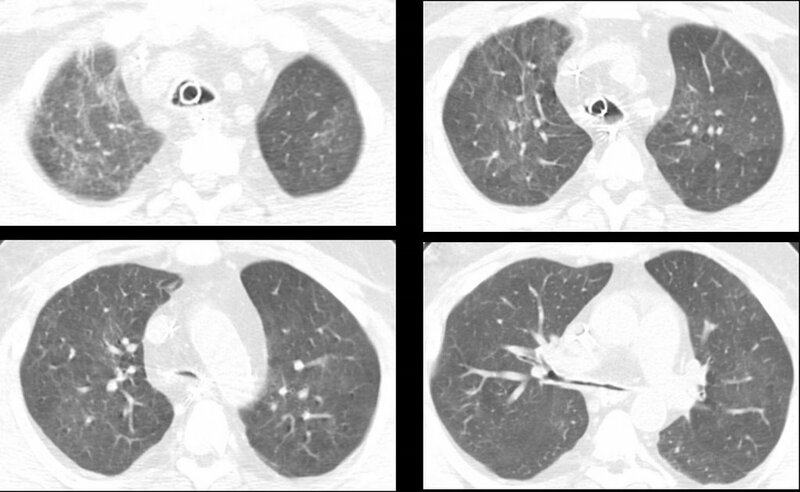 Clavicle XR demonstrates shoulder separation with incidental 1.75cm diameter spiculated nodule mid upper right lobe lung, mild emphysematous changes. CT confirms nodule. PET eyes to knees results no demonstrative uptakes. CBC, Metabolic panels normal. CEA and CA125 WNL. PFTs near normal, demonstrates ability to tolerate surgery. Family HX: Maternal died d/t +NSCL CA with brain, liver mets. Paternal +adenocarcinoma colon, in remission post colectomy and chemo. No other significant family HX or disease. Smoking Cessation in process with nicotine patch use. ETOH use diminishing. Pt. wants no invasive surgery or BX unless absolutely indicated. Lesion is not near bronch, no bronchoscopy in plan. What next? This is a 59 y/o woman with a funny presentation: she had an episode of syncope at home, hit her head and had a skin lac requiring 7 stitches. 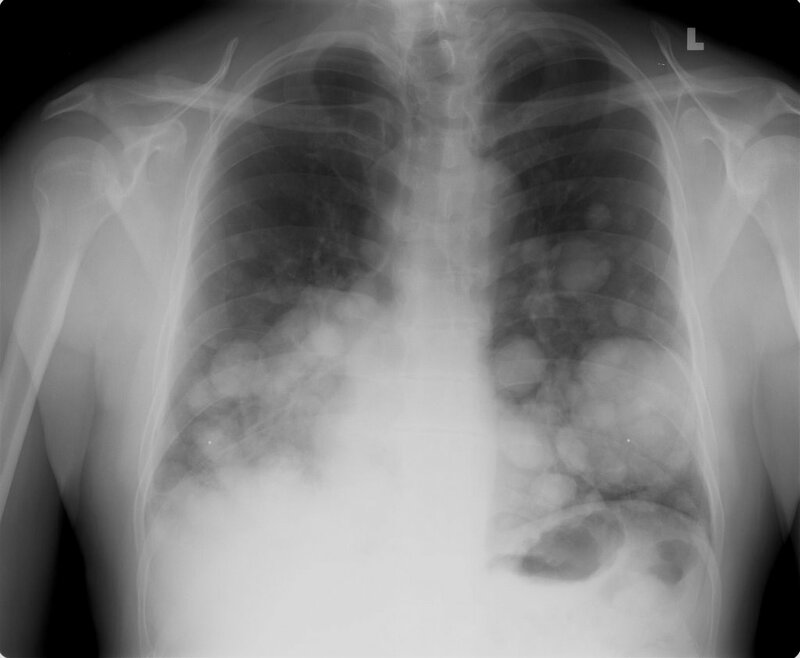 While being worked up in the ER they found her to be hypotensive and febrile with an abnormal CxR and CT of the chest. 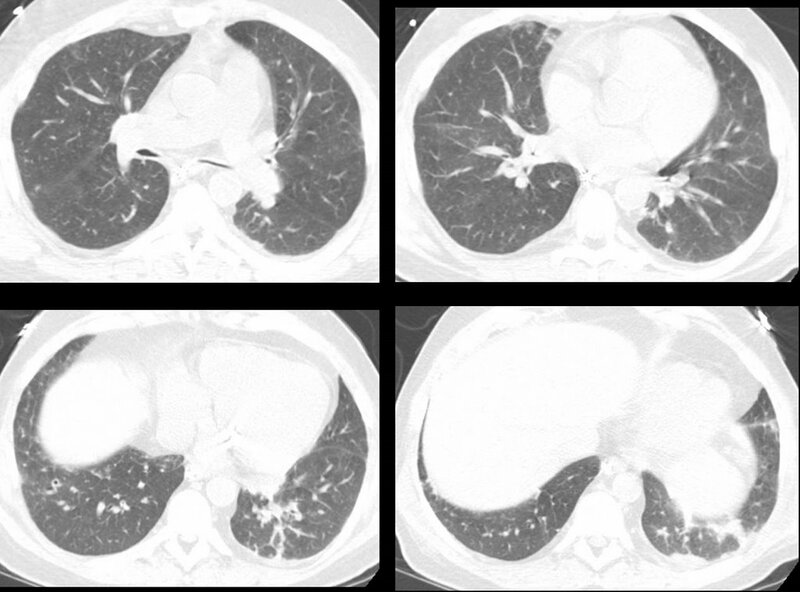 She had MSSA in her sputum and the dense "mass" seen on the left images. I bronch'ed her and got "organizing pneumonia" but no malignancy. She got ABTx and the "mass" went away completely. She has felt better and has good PFTs. However, it has now been 3 months and the peripheral faint patchy areas of reticular disease remain there and unchanged. She has only minimal DOE. She quit smoking in 1988 and has no unusual exposures. How would you pursue this little infiltrates? (they are present in the lower lobes as well). "In celebration of the fact that the IT people in the Department of Radiology at the University of of Michigan have recognozed that their department exists to provide films for other doctors to look at, and have finally made it into the 21st centry by providing consistent, relaible online access to films for the unwashed masses (read: non-radiologists)...I hereby submit this film of an unfortunate man with a history of cancer."